I have tried about half a dozen FTP clients for the Mac. I started simply trying to use DreamWeaver so I wouldn’t need another piece of software but like many things Adobe it proved not so user friendly to use as a simple FTP client. My path eventually lead me to a little program called Flow FTP. It was only $4.99 so I figured “what the heck. I have tried everything else paid and free.” I have been largely disappointed in either the appearance or function of each. I am pleased to report flow not only looks pretty (it matters to me as I spend a lot of time in FTP), it functions well and it comes with a built in editor. 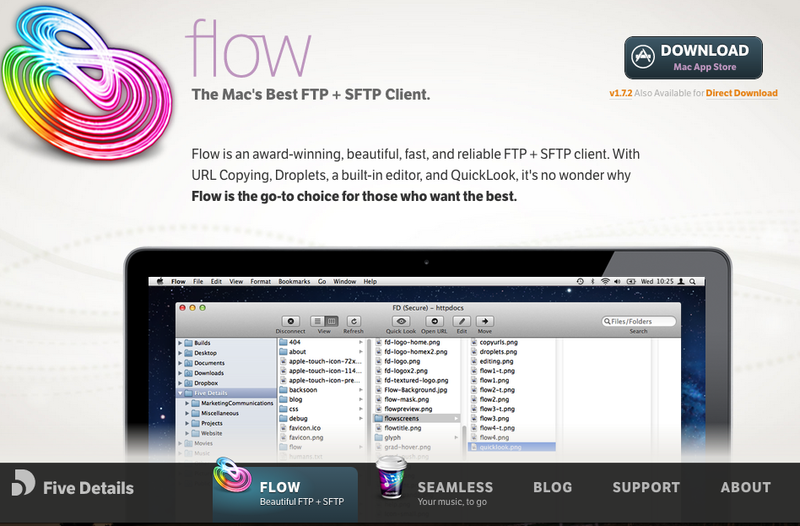 Another feature Flow FTP has; which I found surprisingly hard to find in Mac based FTP clients, is the tabbed connection ability. What I mean by that is the ability to have multiple FTP connections open at once. Thats not to say others for the mac didn’t have but it was either so hidden or so non-apparent that I didn’t see it. Very happy with the Flow FTP client right out of the box without any configuring or wrestling to make it do what I need.